Process: Scene Metrospace is by no means new to East Lansing, Michigan, but in an attempt to ingrain it more into the student and faculty community at Michigan State University, some of their artifacts needed to be revamped to fit the tone for the area, the goals of a typical visitor, and create hype about new exhibits or events. 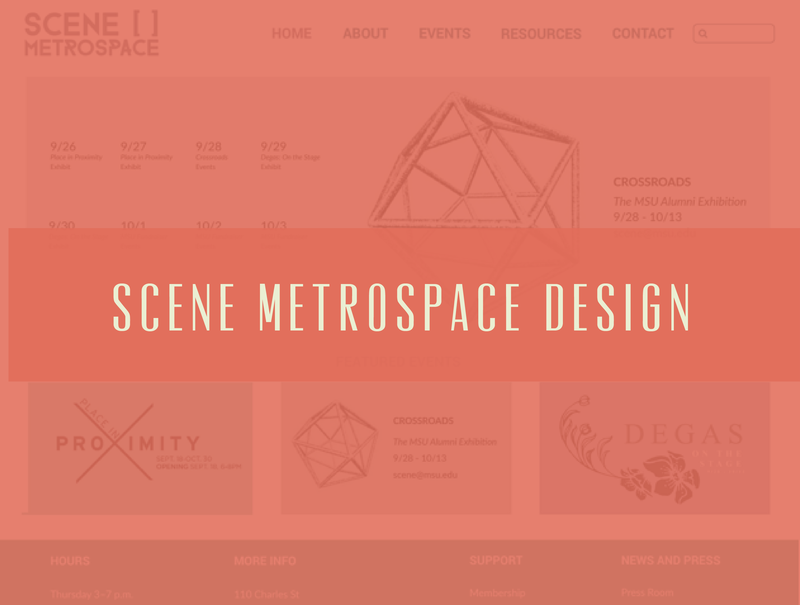 Weighing the sophisticated with avant garde, Scene Metrospace is an alternative arts space that promotes community exhibits and events. 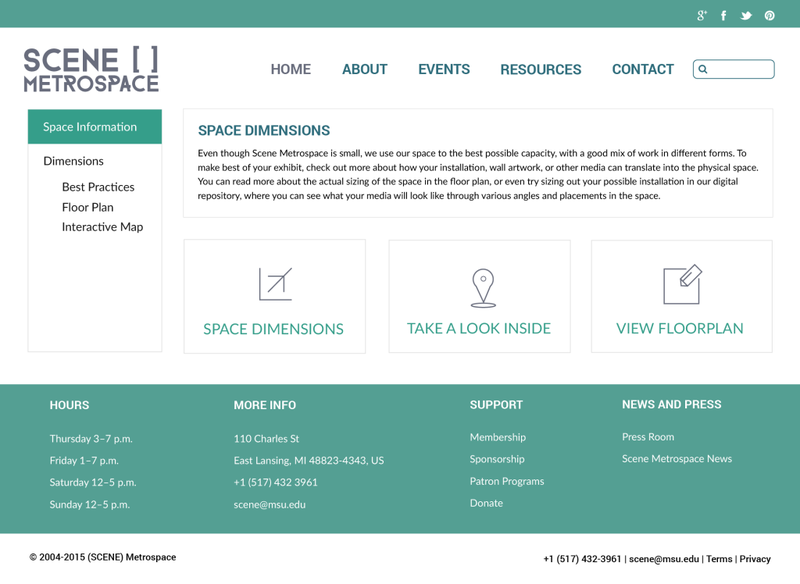 And in collaboration with Scene Metrospace, I helped to design interactive solutions to their current website. Before I could fully design the space, I wanted to explore and see where there might be issues or things that could be conveyed on the site that aren’t currently. The first step I took was to visit Scene Metrospace and take pictures, video, talk with the patrons, and visit during normal working hours to observe the people visiting. What I noticed was that the place, although small, had a lot of different types of media throughout the space. Each artist placed their exhibit with care, and although they differed in media, each nook and cranny of the space had a new surprise, such as an older computer displaying a message from an artist, a 10 ft colored paper, or a video of a woman singing. This specific exhibition had been local, but when I asked about artists participating who are not local, they answered that they often have them as well. This got me wondering, how can the area, while growing, cater to non-local artists the same way that local artists can come and check out the space, measure their area, and come to place the pieces themselves? 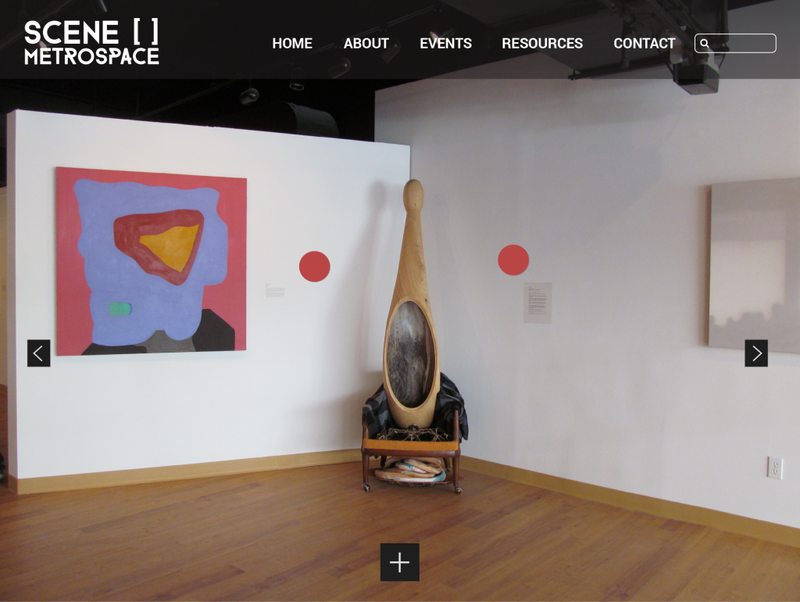 During the same time I explored the physical space of Scene Metrospace, I was creating a landscape analysis that compared the strengths and weaknesses of Scene Metrospace with other exhibitions sites, such as Portland Art Museum, Dumbo Arts Festival, and EMP Museum. The practice of a landscape analysis is to conduct an analysis and evaluation of partner, competitor, or related sites to fit with project wants and needs. The focus is to properly assess the usability and appropriateness of those other sites related to the project, which in this case, was to evaluate digital translations of physical spaces that work to inform, attract, and create a digital community around what the space and experience have to offer. Once I felt that I collected enough research to move into ideation, I created user scenarios that would help me create a product that represented my research in an actionable way. I created my main persona around a non-local artist trying measure a space for their exhibit. Using the site, they would be able to find a blueprint of the measurements and explore the space in a digital walk-through so they would be able to understand how the physical space looks. I created prototypes of the web pages from the start to finish of the user goal, starting from the homepage to exploring the physical space. 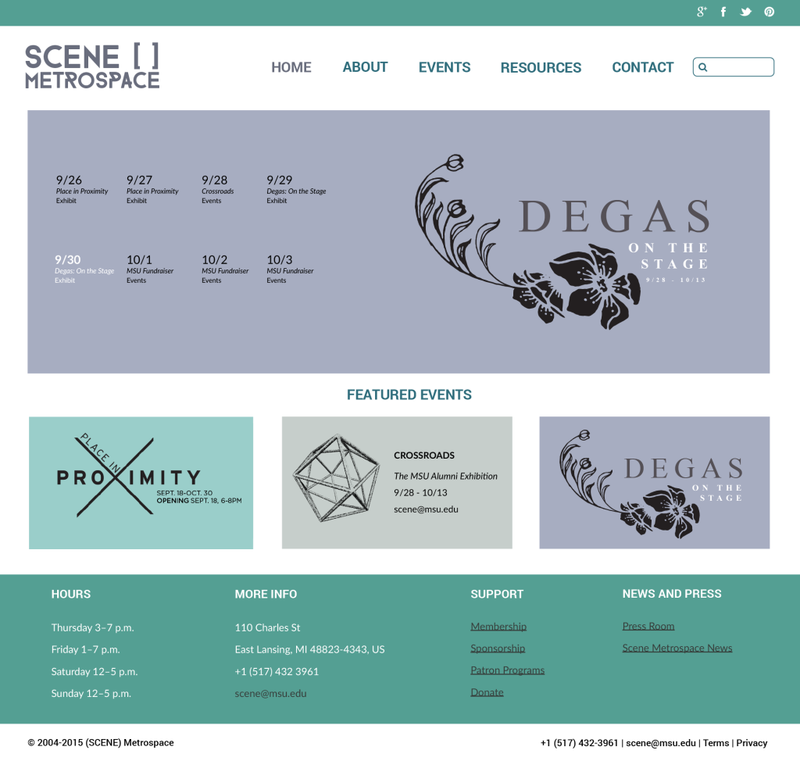 Once my iterations were completed, I presented the walk-through of the site to other designers and the team at Scene Metrospace. Impressed with the walk-through, we have an interesting conversation about opportunities for future implementation of the site and other options that come with the walk-through. As a designer for this site, I had to work alone and meet deadlines and receive feedback. This required strong time management methods, and making feasible, but interactive and creative solutions for a site that previously had not reached its creative potential. I was able to take a strong role as a UX Designer and learned the importance of representing a real-life space through interactive interventions.